This recipe may not be for every diabetic. If your blood sugar is under control and you can control the quantity you eat, this can be enjoyed with a lean protein item. This is a good recipe to take to the office or church, etc pitch-in meals or to make when having the family or company in. That way you can have your serving and share the rest with others. Leftovers? Take them home to have another serving in the next day or two. Important that you not use white rice or white bread! Spray a 9 x 13-inch baking pan with nonstick canola cooking spray. Alternate layers of rice, cheese, and green pepper until all are used. Combine the eggs, milk, salt and pepper in a bowl and mix well. Pour the egg mixture over the layers. 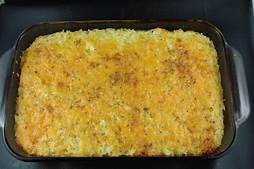 In a small bowl combine the bread crumbs with the butter and sprinkle the crumbs over the casserole. Bake at 350 degrees for approximately 45 minutes until lightly browned. Note: This is a file photo used for reference only. This is not this exact recipe.